Ultrasonic Periodontal Debridement: Theory and Technique is the first textbook to focus exclusively on this fundamentally important component of periodontal therapy. George, Donley, and Preshaw provide a comprehensive resource for dental students, dental hygiene and therapy students, and periodontal residents, as well as practicing dental hygienists and dentists who are looking to increase their familiarity and skills with ultrasonic instrumentation. 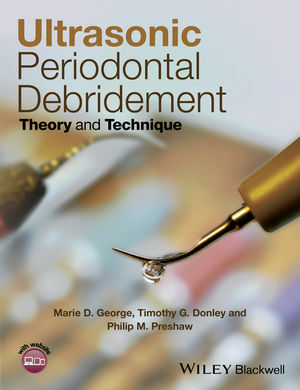 The opening section describes the basic foundational knowledge of periodontal debridement; how it differs from and supersedes scaling and root planing, how it fits with modern concepts of periodontal disease pathogenesis, and includes a comparison of periodontal debridement instrumentation modalities. Section 2 describes ultrasonic technology, the variety of tip designs that are available, and provides practical guidance in appropriate tip selection. Section 3 focuses on the clinical applications of ultrasonic periodontal debridement, including patient assessment, medical and dental considerations, and provides specific guidance in clinical debridement techniques. Included are technique modules for each quadrant as well as case studies using real-world examples of situations likely to be encountered in everyday clinical practice, including ultrasonic instrumentation around dental implants. Marie D. George, RDH, MS, is a clinician, author, and educator, with current appointments as Adjunct Faculty in the Department of Dental Hygiene at both the University of Pittsburgh School of Dental Medicine and the Community College of Philadelphia. She develops and presents evidence-based educational programming specific to ultrasonic debridement to practicing clinicians, dental and dental hygiene students, and faculty nationally and internationally. Timothy G. Donley, DDS, MSD, is in the private practice of periodontics and implantology in Bowling Green, KY, and is an adjunct professor in the College of Health and Human Services at Western Kentucky University. Dr. Donley regularly lectures throughout the U.S. and abroad on the science and clinical applicability of ultrasonic instrumentation. Philip M. Preshaw, BDS, FDS RCSEd, PhD, is Professor of Periodontology and the Course Director for Undergraduate Periodontology at Newcastle University, UK. He is also actively involved in clinical research, with numerous publications in peer-reviewed scientific journals, and has been awarded a Distinguished Scientist Award from the International Association for Dental Research.